Bubbly , Roxy and the little tea pot sounds like the start of a childrens story but no just a couple more samples for the shop. Bubbly is the wise owl made from wool felt, why is it that we assume that owls are wise??????? Roxy- long socks is the new style doll from the Red thread. 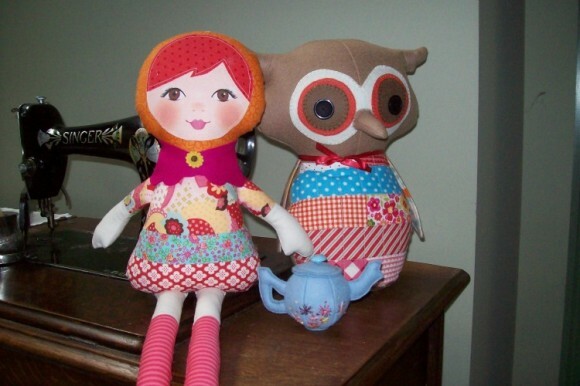 The pattern includes a face to be sewn on or you can make your own face.This doll is very quick project and of course l have them in stock . l also sell the faces separately. The teeny teapot is one of Jodies (Ric Rac) creative cards it was great fun to make and can be used as a pin cushion, also made from Wool Felt. Did you know that l stock wool felt?????? 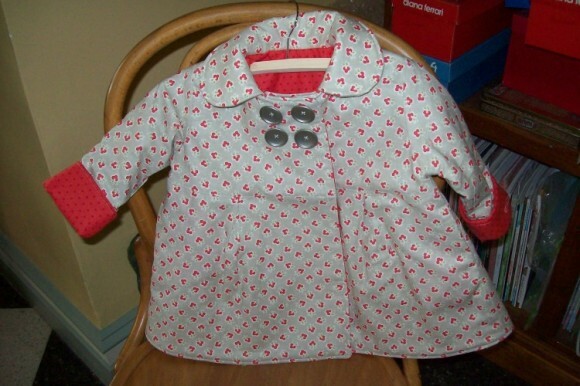 ?well where have you been……….. Next on the agenda was one of Toni Cowards(Make it Perfect) new patterns called Serendipity which is another great jacket. Different to Uptown Girl as it has a double breasted look and little Peter Pan collar. So cute and again in keeping with Toni’s patterns very simple. So who has time to get bored………..not me.